One of the things I enjoy most about blogging -- besides meeting people like YOU! -- is sharing with my friends some of the tips, tricks and techniques I've learned to enhance my cards. Why be "usual" or typical, when you can add something different?! I learned the ribbon weaving technique used on the wreath (above) by watching a YouTube video that was posted by Mei Flower Crafts. Mei Flower Crafts sells the wonderful satin ribbon used to make this wreath -- and even though they are overseas (England), their pricing with shipping is still very competitive and the quality of the ribbon is fabulous! 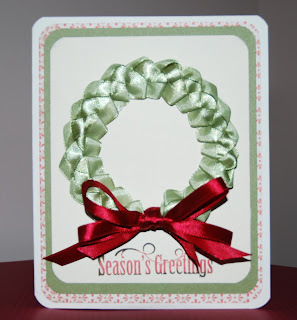 To finish off my card, I mounted the ribbon wreath using foam sticky tape (CHEAP at BigLots!). I then used a Hero Arts Stamp for the sentiment, brushing the stamp with VersaMark red ink. I tinged the edges of the sentiment with Tim Holtz's Distress Inks in Forest Moss prior to stamping. I stamped the sentiment on Vanilla Cream stock, and mounted that on Topiary (green) and then on an Elemental Level 2 paper, all by Close To My Heart (CTMH). 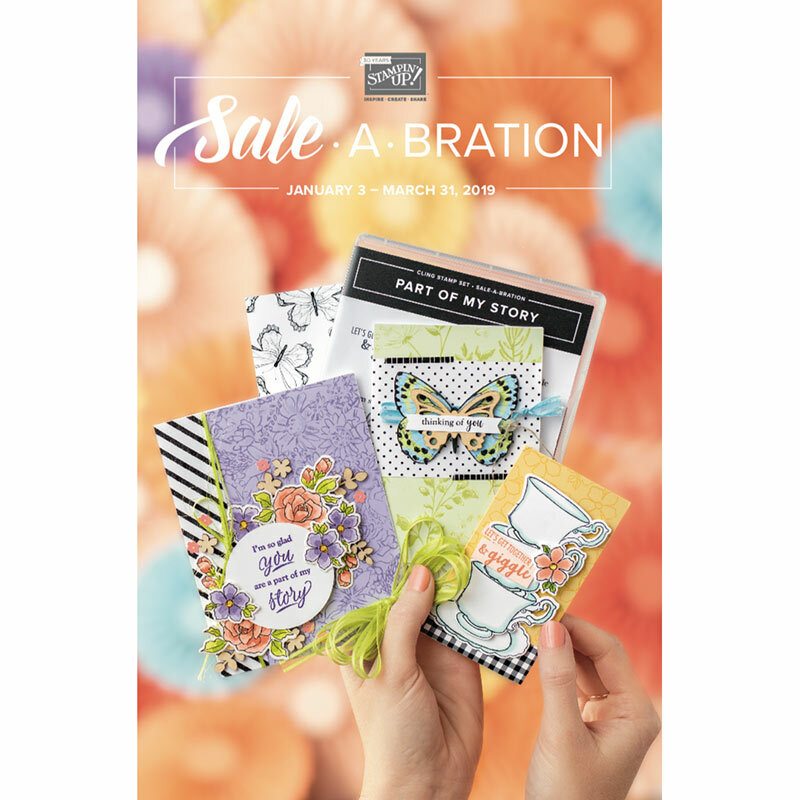 I am a new CTMH consultant -- I became one right after I saw Sue using CTMH products to make a great group of cards ("Make-N-Take") at a recent crop we attended at "ScrapThat! ", an LSS in Burlington, NJ. I must say: I am very fussy about my paper quality when I put so much time/love into my cards ... and I LOVE the feel of the CTMH paper. Liken it to the difference between sleeping on linens you'd get at the bargain basement, to that of the comfort of sleeping on linens made using a high thread-count Egyptian cotton. Standard versus luxury. With CTMH, you get exclusive colors at less $ per sheet than the MSRP of Bazzill cardstock. And there are matching stamp inks! By the way, if you're looking for the CTMH Exclusive Cricut cartridge "Art Philosophy," contact me at cardmonkey@comcast.net or troll on over to my blog and connect via the SHOP CTMH button on the right hand column. This cartridge is a must have for cardmakers, as it's chock-full of card shapes, labels (no more dies! ), and shaped flowers for embellies. 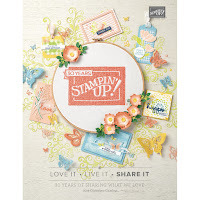 Currently, there's a terrific package deal and you can still qualify for a free Stamp of the Month with that purchase. Well, that's it for me today ... I hope you learned a little today, and loved a lot. Get the scrap out of here and get let your creative juices flow! I love doing this technique but I've never used it on a card... duh! OMGoodness!! This card is super fabulous! Love the colors of ribbon you used. Great job. Wow, Ellen, this card is beautiful. TFS how to make the wreath. Very nice! !--Pat N.
Just popped over to take a "CLASS" on ribbon folding. Thanks for sharing such a neat idea. You certainly put your skills to work and produced an awesome card...beautiful! You want a good laugh? I'm watching this video after fully reading your description (important detail)...AFTER FULLY READING YOUR DESCRIPTION...and I'm thinking..."I didn't know she was English." It's 5 am...what can I say? Beautiful card! thanks for sharing the how to's.